On July 6-7 2018 Source Kids hosted its very first disability expo in Brisbane focused on children, youth and young adults up to the age of 25. This two-day event was an enormous success bringing together the latest disability products, services and technology, along with some incredible speakers all under one roof. It was such an informative, energising and successful event – everyone had so much fun that we’re going to do it all again this year. Make a note in your diaries for July 5 & 6, 2019 and follow this page for updates! There are a number of opportunities for businesses to be part of this event that is expected to attract over 3000 people across the two-days. Find out more about showcasing your business, product or service through exhibiting or sponsoring the Source Kids Disability Expo. 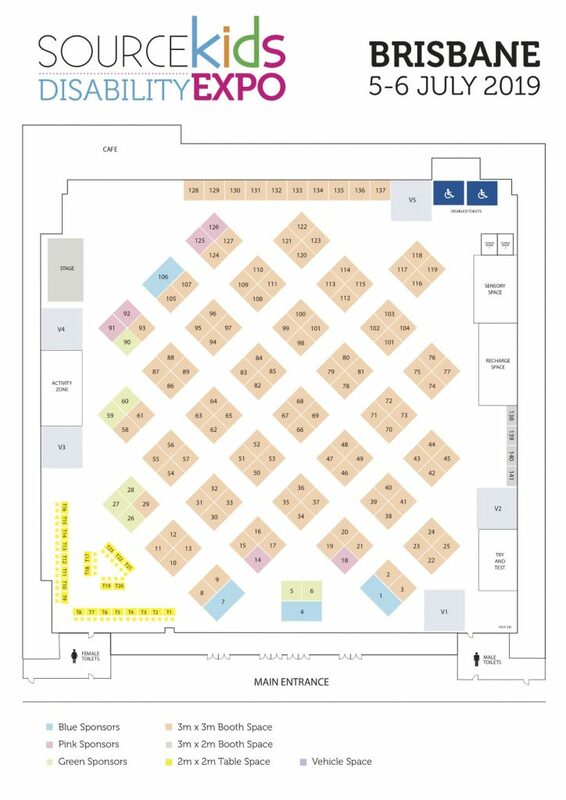 See the floorplan below for the proposed layout and booth location opportunities and find out more by emailing Naomi Sirianni on [email protected] or calling 0447 755 043. We will be releasing details of the Source Kids Disability Expo over the coming months, if you would like to keep updated with key event information, the speaker program, activities, exhibitors, sponsors, competitions and more, register your details to keep up-to-date for this exciting new event. The event will be FREE to attend, and we will let you know how to register to attend this event closer to the time!